On Tuesday 20th October, yr 5 visited St Neots town centre to see The Royal Anglian Regiment 1st Battalion . 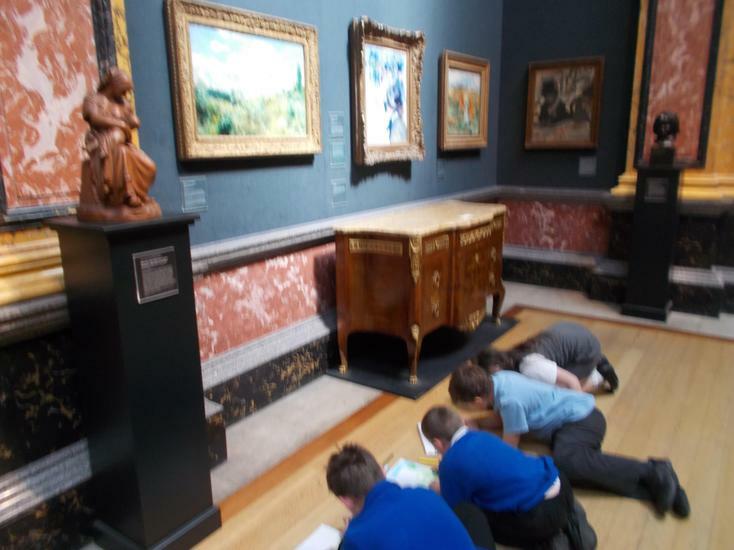 Yr 5 had a fantastic trip to the Fitzwilliam Museum. 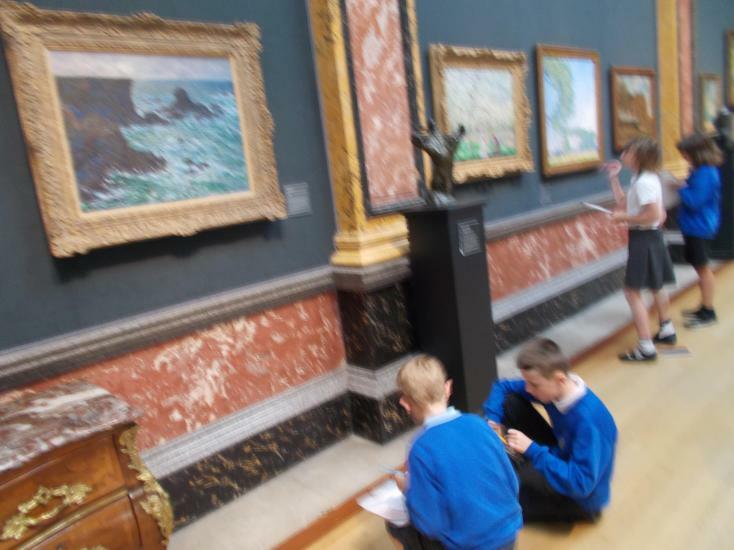 They learned more about the Impressionists and were able to see amazing paintings by Monet. 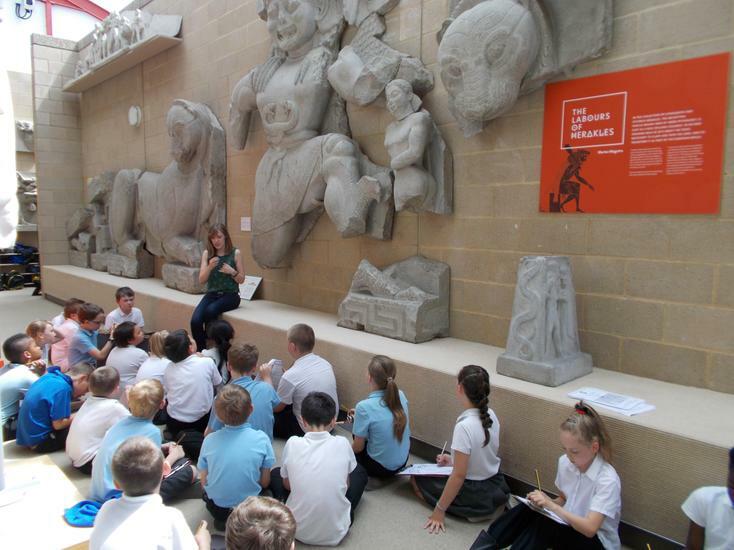 We then went to the Museum of Classical Archaeology, in Cambridge University and enjoyed finding out about the stories behind the artefacts. This week in assembly we had a visit from Stageworks and enjoyed watching a play about e-safety. Yr 5 and 6 then participated in a drama work shop, which was lots of fun with an important message about staying safe online. Three children from year 5 have won a writing competition organised by the St Neots Rotary Club. They were presented with their awards at assembly. Well done! Yr 5 are playing cricket in PE. Every Thursday, as part of our class assembly yr 5 have the opportunity share some of their interests, hobbies or tell the class about an interesting place they have visited. The children investigated which materials were the best insulators to keep an ice cream cold. The children have continued to develop their number work and calculation skills. As part of our work on written methods of addition and subtraction, the children planned a bedroom makeover and were challenged to stick within a given budget ! This half term we have been finding more out about General Elections and how our country is run. The children organised themselves into Party groups, elected a leader and developed the own manifestos. They then gave presentations at assembly and all of the children in key stage two participated in a vote on Polling Day. 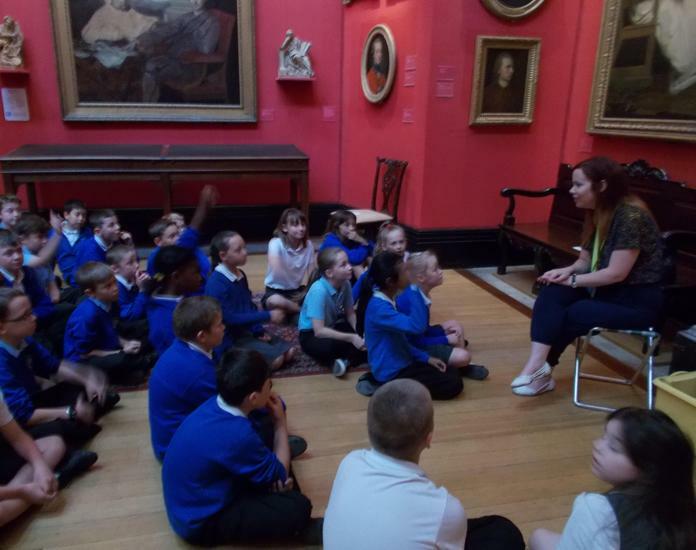 As part of our literacy work on narrative poetry, the children studied 'The Marie Celeste' by Judith Nicholls. 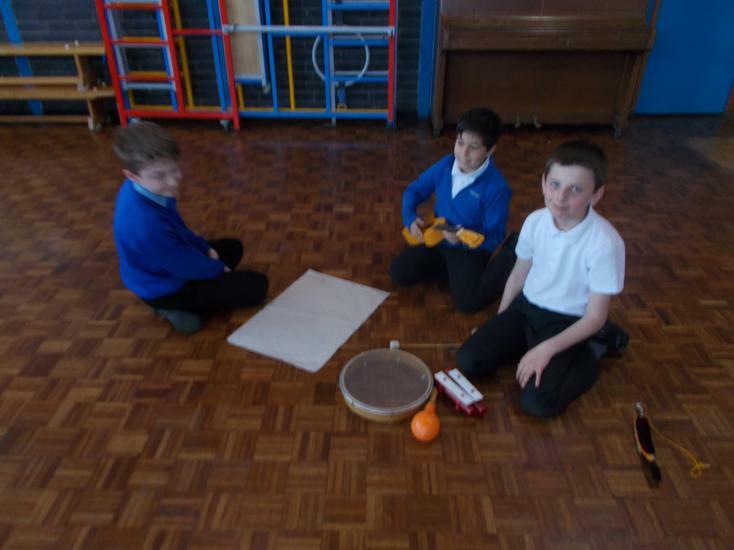 In music, they then developed a sound story map and created a piece of music to represent the mystery. Making models to represent the layers of the Earth. Measuring angles and finding missing angles. In Dance, we have choreographed our own street dance routines using 'locking' techniques and creating formations. In RE, Yr 5 have been learning more about Buddhism. This Buddhism inspired art work was created with the help of our artist in residence, Mr Cornell. First we looked at contemporary Tibetan artists and how they referenced Buddhism in their work. We then created our compositions using oil pastels and a black colour wash. Next we scanned the images to create symmetrical designs. 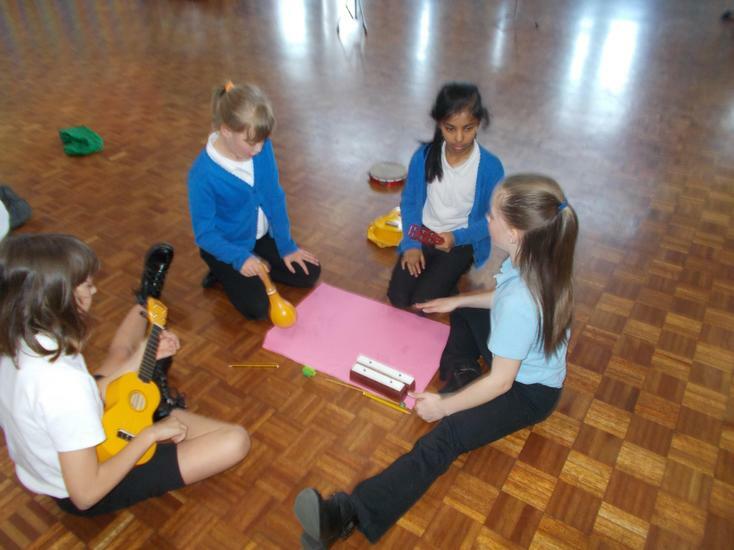 Music - Yr 5 have been learning more about rhyme and rhythm. We created our own raps and mixed them into an Xmas class rap. 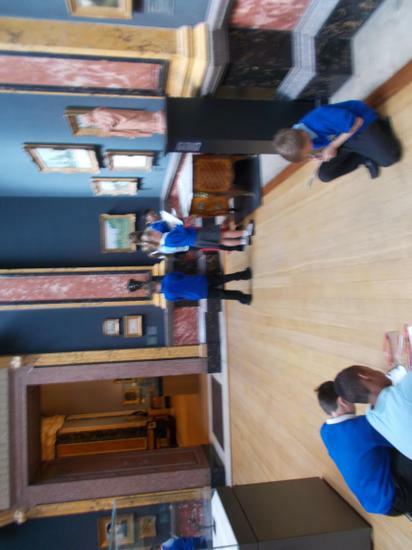 A few photos of year 5 from their museum trip, Friday soup making and learning about and creating Anderson shelters. The class has had a brilliant start to the new school year and Mrs Rimmer is very proud of everyone! Inspired by a visit to St Neots museum, the children have thought of questions they would like to research about the Second World War. 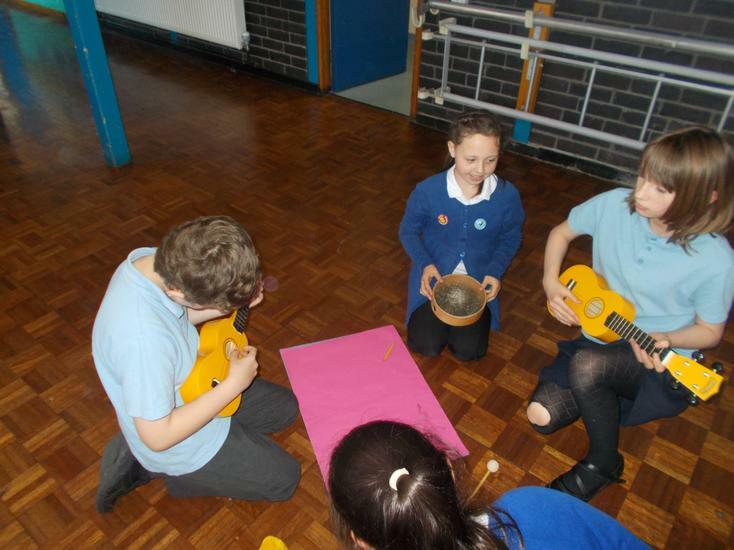 They borrowed a box of museum artefacts including the filter from a gas mask and a wartime helmet which they have enjoyed handling, discussing, describing and drawing. During the creative weeks at the beginning of term the children worked together to make some fantastic model Anderson shelters and painted powerful images of bombing raids in the Blitz. Everyone is looking forward to seeing them displayed in the Year 5 and 6 shared area. The class are enjoying using a Michael Morpurgo book called ‘Friend or Foe’ as inspiration for linking their learning in History and Literacy. They have used drama to explore the theme of WW2 evacuation and have now completed their first drafts of imagining a journey as a wartime evacuee. Every Friday morning a group of Year 5 children work with Miss Clarke in the kitchen as soup chefs! They research recipes, make shopping lists and prepare the ingredients as well as cooking two different flavours of soup per week. The teachers pay £1 per bowl for such delicious creations so the children can then calculate their weekly profit. The children who have just moved up to Year 5 have made a fabulous start to the new school year making their teacher, Miss Smith, very proud indeed! They have already won the award for the best attendance in the first week of the school year and are trying very hard to be the best class at Maths Whizz and Accelerated Reader too. Keep up the great work Year 5! Last week we had a really exciting time in our Creative Week with an International Day, visiting France, Germany and Scotland to learn some of the language and traditions as well as tasting the food. Everyone loved the french breakfast with 'chocolat chaud', 'croissants, and 'brioche'. Yummy! We had a fantastic time on Friday developing our Design Technology and Science skills in the hall in the Great Egg Race Challenge. We had to work in teams to design and build a vehicle to transport an actual egg for 1 metre...and we weren't able to touch the vehicle at all to start it moving. 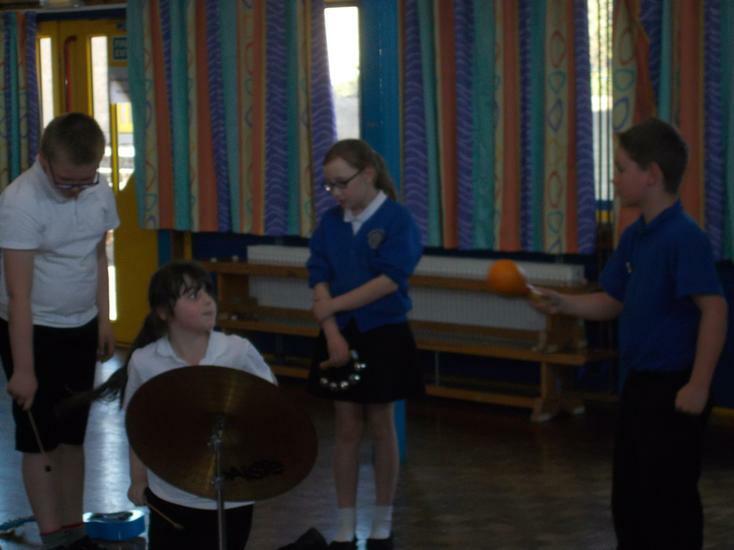 During the rest of the week we learnt street dance, music, drumming and PE as well as painting and collage. We continued lots of fun activities in our second full creative week. Miss Smith was amazed by some of the creative collage work which the children produced. We went travelling again, this time to Spain and China ....and the week culminated in a pizza afternoon on Friday. Hope everyone is ready for some Literacy and Numeracy on Monday! We have now completed two weeks of our Numeracy, Literacy and Science curriculum in the classroom plus learning all the other subject areas in the shared area. In Numeracy we have already practised some of the calculation methods we learnt last year; luckily most children remembered them...eventually! This week we are learning about factors and multiples and starting to revise our knowledge of 2 dimensional shapes. In Literacy we are writing our own versions of a traditional tale called Lazy Jack. In Science we are learning about plants and have already learnt about life cycles and the four main methods of seed dispersal. Today we started an investigation to find out which conditions are needed to enable seeds to germinate. We will let you know what we discover but in the meantime follow this link to watch a time lapse film of some bean seeds germinating. Everyone worked very hard last week at their Maths, Literacy and Science. Mrs Mitchell teases us that she's getting fed up of seeing Year 5 forming a queue at her door to claim their multiplication badges! This week everyone in the class received an egg freshly laid by our school chickens to take home and cook however they like. Kira scrambled hers and here is a photo of Miss Smith's egg frying this morning. We are planning to make a tally chart or block graph to show all the different ways we cooked our eggs. We found out the results of our germination investigation yesterday. None of the seeds in the fridge germinated so we think that seeds need warmth. None of the seeds without water germinated so we think that they need water. The seeds that had no light or not much air (because they were in a plastic bag) did germinate so we think that they don't need light or air to germinate, although they will need these to grow into healthy plants. All this ties in with what we know about seeds in the garden and in the wild. In Autumn the seeds are dispersed and may fall onto soil where they are gradually covered up. Nothing happens in the Winter when it is so cold but in the Spring the sun is hotter and warms the soil. Rain showers and warm soil mean that the seeds germinate. We have given all our seeds to Mrs Wood so hopefully they can grow on in the polytunnel. Today we had an amazing visit from the 'Climate Cops' and we spent the afternoon as cadets in the academy, learning all about climate change and ways of generating electricity. Most importantly we learnt that we can all make small changes to save energy. This term we are learning a poem called 'The Highwayman' which was written by Alfred Noyes. It is exciting and dramatic with lots of powerful vocabulary including similes, metaphors, alliteration and onomatopoeia. There were quite a few words that we did not know at first so we have been very busy looking them up in dictionaries and thesaurus'. Some of the new words we have learnt include torrent, galleon, rapier, moor, claret, casement, sniggering, cobbles and writhed. In Maths we are learning about fractions, decimals and percentages. It has been really tricky but everyone has really challenged themselves to work hard and has therefore excelled. We now understand equivalences such as 75% = 3/4 = 75/100 = 0.75. We know that if 64% of the class are having school dinners, then 36% will have a packed lunch. Our Science topic is actually called 'Earth, Sun and Moon' but we have all loved extending the topic and researching all the planets in the solar system...and beyond! Today we went on a visit to St Neots library. For some of us it was the first time we had been to the library so we were able to get a library card and borrow books for the first time. We could hardly believe that you can borrow up to 12 books at atime and that it's free! We need to remember to take back our books in half term so we don't get a fine though! The librarian showed us how the library works and we learnt that fiction books are arranged on the shelves alphabetically by the author's surname whereas information books are arranged by topic. The behaviour of the children in the library and walking through town was, as expected, excellent and they represented Winhills well. This week we have been learning to write narrative from the viewpoint of another character. We imagined that we were Bess (the landlord's daughter in the Highway poem and wrote a diary entry describing the tragic events. Each day we have looked at a different part of the story and tried to use the most powerful and emotive language possible, constantly editing and improving our work until we are happy with the final version. Miss Smith is hugely impressed with the progress towards writing targets and thinks that the final diary entries will really be pieces of work to be proud of. We found out in assembly that we had won the KS2 certificate for the most children taking part in the NSPCC fundraising sponsored spell. We feel really proud that we could help so many other children. Miss Smith has updated the Winhills Weather Centre in the Year 4/5 ICE Zone so that we now have to investigate the weather in different cities around the world. We decided that, although the Winter Olympics are actually being held in Sochi, it might have been better if they had been held in Whistler in Canada! 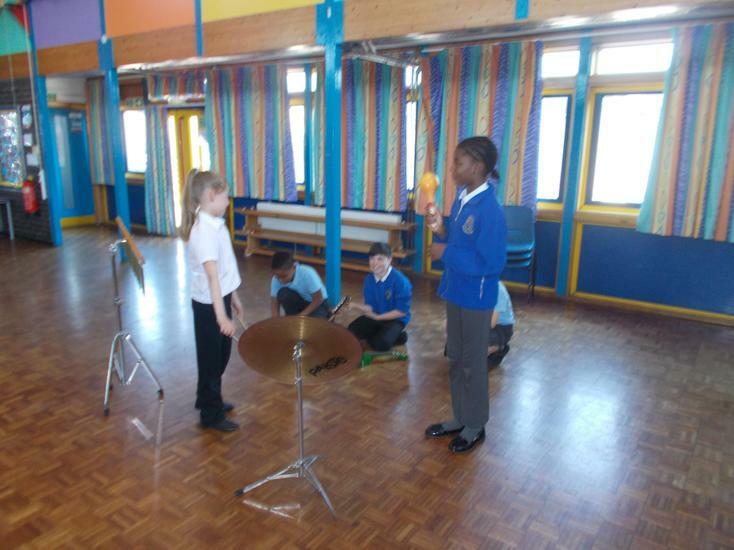 As well as learning in school time Year 5 are also very busy at 3.15 taking part in a huge range of clubs. Children go to zumba, tennis, sewing, maths whizz, keyboards, Little Gems, homework club and Mr Franco's sports club. We are very proud of the wonderful sewing that has been completed in sewing club on Thursdays. Miss Smith had a great time marking all the Literacy books over half term. As expected the diary entries written from the viewpoint of Bess (the landlord's daughter) in The Highwayman were all absolutely amazing and it was difficult to choose only two for the website. Year 5 really excelled themselves by making imaginative and lively word choices. Great progress towards their Literacy targets! Yesterday was the most terrible and disastrous day of my life. I was so scared my heart felt like it was going to come out of my chest! The rain was pattering quickly on my casement. All at once there was an horrendously loud crash and flash of lightning. It was so loud that it made me shriek. Just at that moment the red coat troops stormed in and found me trembling with fear under my thin narrow bed. They firmly gripped my wrists and pulled me out from under it. They gagged and bound me so I struggled to get free but all the knots held good! If that wasn't bad enough they tied a musket under my breast! As the troops kissed me disrespectfully it made my flesh go numb. In the distance I could see my cherished highwayman galloping towards the inn. I writhed my hands until they were wet with sweat or blood and at last I felt something cold and hard. It was the trigger! As I touched it my blood ran cold and my fingers tingled for a second. I knew the time had come. I pulled the trigger and BANG! I shot myself. That was the last time I saw my beloved highwayman. I felt myself sinking down, blood gushing from me onto the stone cold floor. Look at a display of some of our exemplary work. Some very talented Year 5s showed off their keyboard skills at the beginning of assembly today. 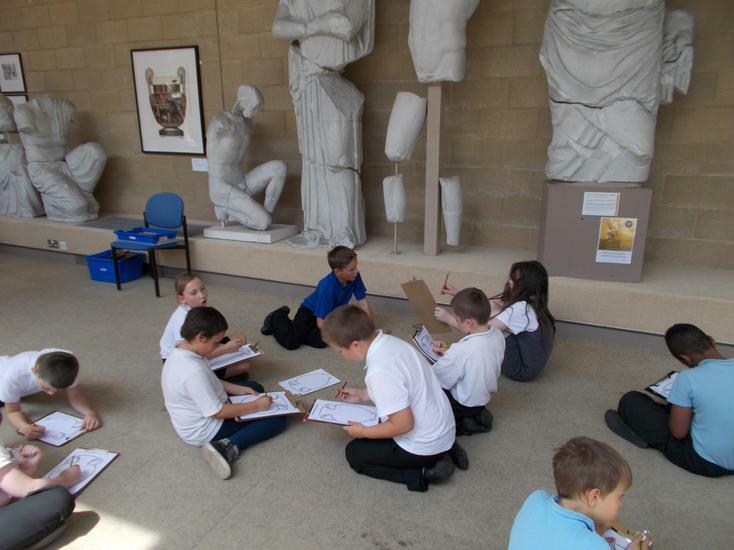 Seven children from Year 5 have been on a residential visit to Grafham this week and have had an AMAZING time. They went with a group of Year 4 children and Miss Barnett so look on Year 4's class page to see some photos of the scary but exciting activities!! We have been writing poems about Spring and about daffodils while there has been some fabulous observational drawing taking place in the ICE Zone. As everyone probably knows today is World Book Day! We have celebrated with DEAR (Drop Everything And Read) and by decorating potatoes as book characters. Mrs Mitchell chose the cyberman to be the Year 5 winner so 'Well done!' to Chloe. Look at our photos - we found some unusual places to read including the PE hall, a corridor, a saxon tent and a viking longboat! Today we walked to Waterstones bookshop to spend our £1 World Book Day vouchers. Everyone was brilliantly behaved and loved looking around before choosing their book. As soon as we arrived back at school it was time for DEAR again! We're planning to take'Accelerated Reader' quizzes on these books after the weekend and are aiming to achieve scores of 100%. Thank you to the staff at the bookshop for being so helpful and friendly. Year 5 have been learning about perimeter by using a trundle wheel to measure the field and playgrounds to work out how many laps everyone needed to run, walk, skip, hop or dance in order to complete a mile for Sport Relief. We calculated that 3 laps of the field, 9 laps of the playground or 14 laps of the Foundation Stage playground were equivalent to 1,609 metres (1 mile). Everyone completed at least one mile .... and some completed two or even three miles, some people accessorising their PE kits with sunglasses, rabbit ears or hula skirts! Other learning taking place in our ICE zones has included weaving. We are also making our own weaving frames and intend to dye some fabric ourselves using food dyes as the Vikings did. Each day a group of children make soup for lunch. They research the recipes, make shopping lists, prepare and cook the soup, keep a record of costs and collect payment from the teachers. Next week we are having a Viking Day in Year 4/5 so the soup for that day will be Viking Green Soup which sounds intriguing! This week Miss Smith has been really impressed by the way that so many of her class, particularly some of the boys, have turned into bookworms! They walk around the classroom with their noses in books and are constantly pleading for more reading time. You have a great attitude to your learning Year 5 and I am already seeing improvements in your Accelerated Reader results. Well done! Today we had a visit from a 'real' Viking! He showed us a timeline to show when the Vikings were exploring, invading and settling. He taught us all about weapons and explained many aspects of Viking life. At what age did a Viking boy become a man? Why did Vikings die young? How did Vikings hunt boar? At what age did Vikings name their children? We had the opportunity to observe and handle Viking artefacts, thinking carefully about what they may have been used for. 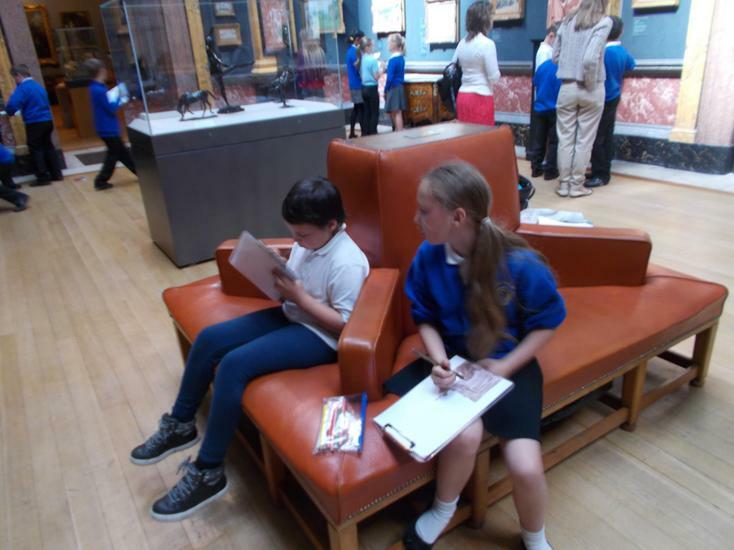 Our drawings were extremely careful and detailed. We also learnt to play a Viking game of strategy with a board and counters (a bit like chess). Here is a link to have a go at home. All the children who have behaved well this term have had a fantastic reward day today! We were able to wear our own clothes for the day as a reward for wearing correct school uniform and PE kit on all the other days. Chocolate and Easter activities have included cooking and decorating cakes, making chocolate milkshakes, watching films, colouring, making art and craft homes for chocolate eggs, finding as many words as possible from HAPPY EASTER, creating shapes with mouldable chocolate ....... and eating chocolate!!! Year 5 came back after the holidays to find that the ICE zone had miraculously transformed to be South America! There is a travel agency where the children can research the countries of South America. They are compiling fact files about the human and physical features as well as the weather, currency, flag and language of each country. They are also solving maths problems about distances, flight times, time zones, currency exchange and prices. 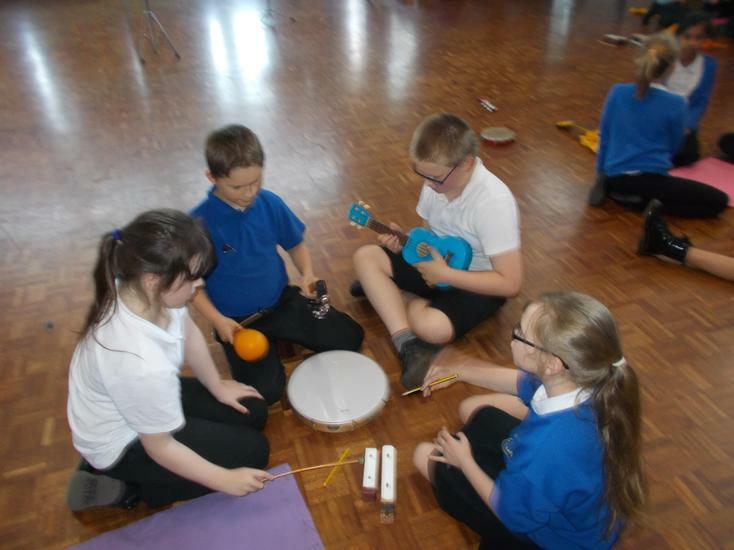 In the rainforest the children have the opportunity to listen to the natural sounds of the rainforest and be inspired to write descriptive poems. 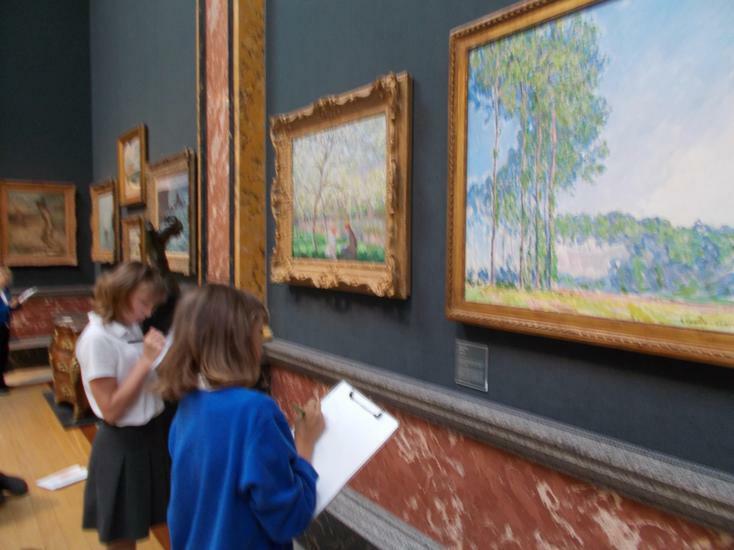 Art this half term is inspired by a painting by Henri Rousseau so the focus is on colour mixing and using a variety of brush strokes to paint individual rainforest animals before making fabric and paper collages to camouflage them! Mr Cornell has also helped many children this week to experiment with water colour paints then adding details using a fineliner and then creating a huge group collage. Outside, the children have been investigating the local area by compiling block graphs of the bird visitors to the grounds, by learning about the directions in which the wind blows the clouds and by painting the changes in the Spring landscape. They also released our froglets into the pond! In the classroom Year 5 have been practising their mental maths skills and consolidating their written methods for all four operations. Grammar skills are a big focus at the moment especially the correct use of apostrophes and commas. The children have been practising usung these skills while writing reports about Giant South American Anteaters, not forgetting to include compound and complex sentences in correct paragraphs. They worked in pairs and small groups so that they could support each other in writing really powerful sentences. Year 5 have a had a very busy start to the new school year. 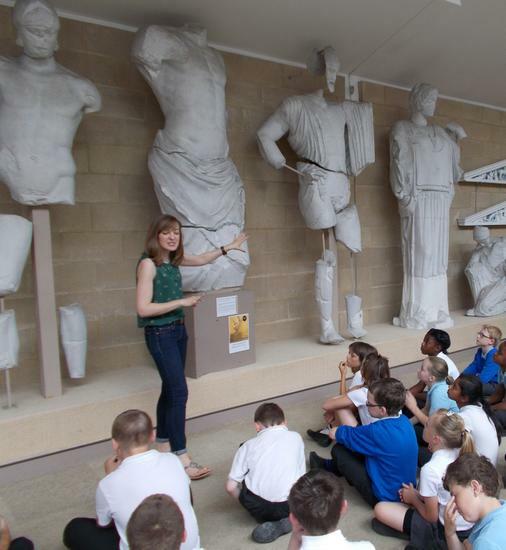 A CSI day, Street Dance session (catch the video on the winhills facebook page), low ropes, raft building, and a day as a Roman apprentice have warmed us up nicely for the busy year ahead. A massive well done to our first achievers of the year Jack and Mia and we look forward to celebrating success after success. Year 5 have really been settling down to some great learning over the last few weeks and are producing some work of which they can be really proud. Each night Miss Smith is really enjoying reading the next chapter of their hilarious stories about 'Lazy Jack', the boy who poured creamy milk into his pocket and tried to cram a donkey into a rucksac! When the stories are completed we will publish some on this page. As part of our work on the Aztecs and to help with our geographical research tasks, we have been learning about the points of the compass. Have a look at the photos below. We have had a lot of fun this week learning about Aztec gods. Some of the names are really difficult to pronounce! Miss Smith was very impressed by some of the drawings that the children made...much better than she could do! Here are some websites to help with research about the Aztecs but remember to check with an adult before using the internet. Remember what I say to you every day... "Reading and maths whizz!" Well done Year 5 for completing your WeeMees and profiles for your blogs. If you haven't quite finished you can do that at home ...ask me if you're not sure of your password. Below is a picture of an Aztec artefact discovered in Mexico. Can you think what it is, what it's made of and how it was used? 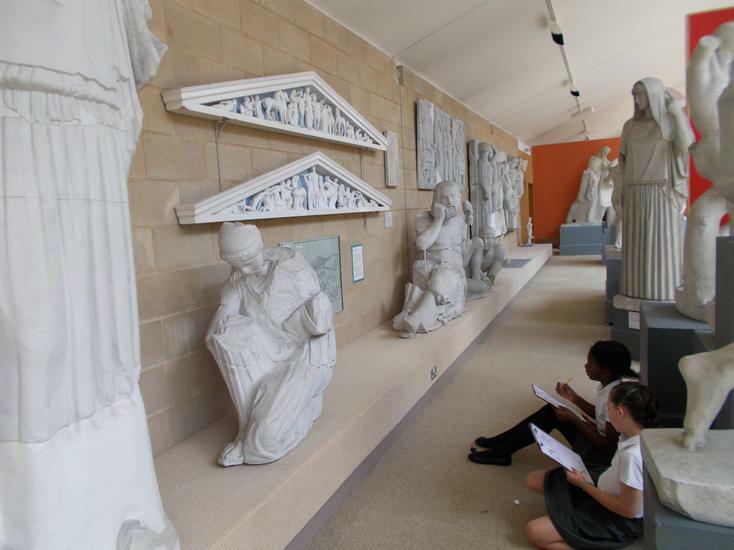 Year 5 came up with some brilliant suggestions when we were looking at other photos of artefacts in class this week. Try looking on some of the websites I've given you above. Year 5 made some fantastic Aztec calendars this week based on the amazing stone calendar or sun stone that was unearthed in Mexico City a few hundred years ago. Nobody knows for sure how every detail of the calendar works but we had great fun adding the 20 symbols for the months and drawing dots to represent the 13 days in each month. Look at our finished ones below! This week we made bird cake to feed our feathered friends and then wrote instructions so that other people can make bird cake themselves. Because the instructions are so clear and easy to follow, the Year 1 teachers are planning to use some of them with their class! Look below for some of the photos. Next week we are planning to start making the Aztec masks and headdresses we have designed so watch out for some a-m-a-z-i-n-g pictures! This week we have written instruction leaflets for new zookeepers about how to care for giant pandas....sounds like a dream job! We are planning to send some of our instruction leaflets to Edinburgh zoo to help the keepers there! Below are lots of photos of the children starting to make their masks and headdresses. Some are quite scary so be prepared! The children worked very hard and Miss Smith was very impressed by their independence and team work. The Aztec masks and headdresses are finished, the classroom is tidy again and all the designs have been evaluated. Have a look below for lots of photos of the making process and some quite terrifying final products, beautifully modelled by their creators. Well done Year 5 - you have worked really hard and achieved some fantastic results! Year 5 have really been enjoying all the Christmas festivities and rewards. A huge thank you to all the children who have learnt the songs for the carol concert so well - you performed brilliantly and we were all so proud of you. A huge thank you too to Mrs Connell for reward day. The silent disco was absolutely fantastic and a brilliant reward for all the children behaving so well throughout the term. Everyone loved coming in their own clothes too as a reward for looking so smart in uniform every other day. Year 5 have made a really good start to the New Year with lots of good intentions and resolutions about always remembering to do 1 hour of Maths Whizz and also to read much more regularly. Everyone is going to try to take Accelerated Reader quizzes more often and try really hard to get 100% in each quiz. Everyone agrees that our snow (highway) man is the best!!! This afternoon we went to visit the Barford Road Pocket Park - some children had never been before even though it's so close! We had a good look at the river and streams as part of our Geography work on the local area and took lots of photos which we are going to use as inspiration for our landscape paintings after the half term holiday. It was definitely very cold and wintry (brrr!) so we plan to visit again when the weather is warmer so that we can see the changes. Hopefully there'll be a greater variety of plant and animal life...and maybe we can even take a picnic! This morning we all walked to Waterstones bookshop in St Neots to exchange our World Book Day vouchers for a special free book each. The bookshop manager was really welcoming and Miss Smith also bought two books to read to us in the classroom. We've already started 'Buried Alive' by Jacqueline Wilson and we're also enjoying our own individual new books...'Hang in there Bozo' by Lauren Child, Tom Gates (Best Book Day ever) and Horrid Henry's Guide to Perfect Parents. Look below for some photos of Year 5s first go on the new trim trail. Yesterday one of the writing tests was to write a persuasive letter to Mrs Connell explaining what new equipment they would like in the playground. Some children have written compelling arguments for a heated indoor swimming pool, an Olympic sized running track and a football stadium....so watch this space!!!!! This afternoon we all gathered together on the playground with our bikes and scooters so that the 'Bike it' man (Stuart) could help us practise our skills such as braking, turning, stopping and weaving between obstacles. Look at the photos below to see the clues we brought in to help our friends guess the name of a book we like. We have all worked so hard this term that Mrs Connell rewarded us with a day of no work and lots of fun chocolateactivities. We had a chocolate easter egg challenge where everyone had to decorate their chocolate egg and enter it in one of three categories - fashion, home or transport. We chose 3 winners but everyone had a chocolate prize! We also had a chocolate fondue with fruit and marshmallows and made chocolate cornflake nests with chocolate eggs in. In the afternoon we drank hot chocolate and watched a film - 'Charlie and the chocolate factory'. We also did some singing and dancing while nibbling little chocolate treats. Brilliant fun all day long! As everyone associated with Year 5 already knows, we are holding our Big Bake on Friday this week. Look at the 'latest news' page for more details!! Below are photos of our advertising posters and of us making them. We think they are very effective. Look below for photos of our brilliant day at Hinchingbrooke Country Park!